Amaryllidaceae - amaryllis family Monocot. 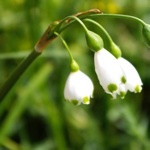 Leucojum aestivum is probably the plant referred to as Moly in Homer’s Odyssey, although this is disputed. and other plants have been been suggested. ... its root was black, its flowers milk white; its name amongst the gods was Moly. For mortal man it is perilous to pluck it, but for gods all things are possible. Homer. Odyssey 10 (trans. Shrewring). On their long, tumultuous journey from Troy, Odysseus and his crew landed on the isolated island of Aeaea, close to Oceanus, the great sea which surrounded the earth. This was the home of the goddess Circe, daughter of the sun god Helios and Perse, an Oceanic nymph. Circe had vast knowledge of magic and the use of herbs, drugs and potions and she carried a magic wand. When a group of Odysseus’ crew went to the palace of Circe, they were given food which was laced with a herbal concoction, which induced a deep sleep. Circe then waved her wand and changed the men’s bodies into swine and herded them into the pigsty. When he went to free his men, Circe greeted Odysseus; she bathed him in water fragrant with herbs and gave him food and wine and, using her feminine wiles, she tried to seduce him. Again the food had been poisoned but Odysseus was protected from the witch’s evil magic by the wild herb, Moly* (Μώλυ) which was given to him by the god Hermes. With the help of his mighty sword he resisted Circe, then insisted that she made a sacred oath not to harm him. Odysseus was then able to persuade Circe to return his men to human form and he and all his crew then spent a whole year in Circe’s palace, feasting and drinking good wine. Towards the end of the year, his crew became restless to return home and they set sail for Ithaca, with advice from Circe on how to avoid further perils along the journey, though this was not to be and further adventures awaited the comrades.